Cycling trips in the region of Podhale and Spisz. Itineraries shall be adjusted to customers' needs and requirements - variuos length, difficulty, toughness, etc. Let us know your interests and we shall make sure to cater for your expectations. This is a half a day trip to Dunajec river in the Pieniny Mountains. White water rafting starts in the village of Sromowce, some 50 km away from Zakopane, and finishes in a former spa of Szczawnica. Rafting starts with a short instruction on safety issues and equipment distribution. Safety helmets and life jackets are provided. Pontoons take 6 pax. at a time, rafters are escorted and an instructor is present at every one of those. Rafting itself takes 1,5-2 hours depending on water level. Return to Zakopane, after arrival to Szczawnica. 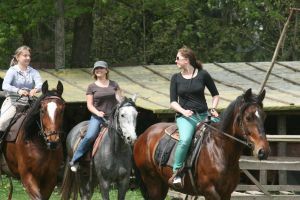 A couple of hours outing to the neighbouring village of Kościelisko Kiry, where we offer free ride in the countryside with instructor for advanced riders, or instruction in the paddock for begginers.